Now for a piece of sheer nonsense. 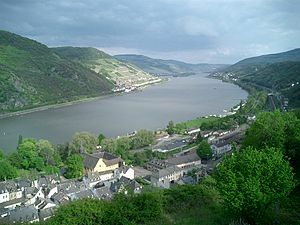 ‘Sweet Flows the Rhine’ is a piece of lighthearted nonsense in the manner of a women’s magazine story that I wrote for a writing competition for my Sevenoaks writing group. It caused a scandal by being too sexually explicit so it wasn’t placed and I’ve since taken out the offending passages so that it is fit to publish on this blog. It was inspired by a summer trip on a Rhine steamer when I was travelling on business and I have tried to recreate the sense of ‘outsiderness’ when one is alone and everybody else is having fun. Bacharach is a real town and really romantic. This entry was posted on November 8, 2013 by edward654 and tagged Bacherach, Rhine.